It was a rainy day in July 2002 when I was first introduced to Harry potter. My father had brought the book, Harry Potter and the Philosopher's Stone , from the local library. That was the day and its today in 2013 I am as hooked to Harry Potter, maybe more so than before, as I was in 2002 when I first read about him. The Harry Potter phenomenon started in 1997 when the first book, Harry Potter and the Philosopher's Stone , was published in Britain. 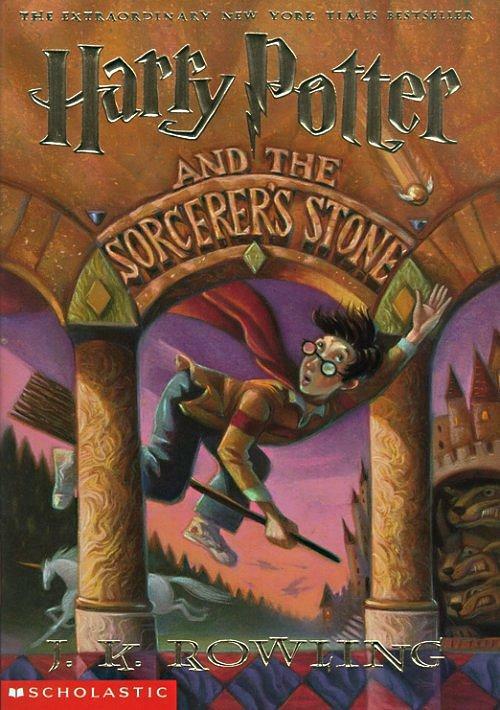 The same book was published as Harry Potter and the Sorcerer’s Stone in the United States. It was the debut novel by J.K. Rowling and brought great acclaim to her as an author. The story revolves around Harry who is an orphan and is being brought up by his Aunt and Uncle. He is mistreated by his relations, who make him sleep in a cupboard under the stairs. Strange unexplained things have always happened to Harry like strange people bowing and winking at him as if they know him or howsoever times he got his hair cut they instantly became long and unruly like before or one time his aunt tried to forcefully make him wear Dudley’s old sweater and it got so small that it didn't fit him which was impossible because Dudley was so fat. The dilemma with Harry is that others know more about him than he does himself. He has no recollection of his parent’s death and is forbidden to ask questions about anything. He is only told that they died in a car crash. He has a queer lightning shaped scar on his forehead and feels that that is the only notable thing about him for he is skinny, wears Dudley’s old baggy clothes, has his spectacles kept together with cello tape and never seems to be able to get his unruly, black hair in order. But soon life takes a turn and he comes to know that he is no ordinary boy but a wizard!! Yeah you heard me right. Harry Potter is a wizard whose parents died not in a car crash but trying to save him from Voldemort (or “You-Know-Who” or “One-Who-must-not-be-named”), who inspires such fear in people that no one dares to call him by name. Now its ten years since Voldermort killed Harry’s parents, tried killing Harry and disappeared mysteriously (some say that he lost his powers but is still in hiding; waiting to come back) but his terror still lingers in the minds of the wizard community which fears his return. Harry soon finds himself whisked to Hogwarts School of Witchcraft and Wizardry where he makes friends, fights trolls, plays quidditch, has classes on potion making, defense against the dark arts and other magical subjects and also comes to know more about his parents and the man who killed them, Voldemort. Voldemort is again seen trying to come to power through the Philosopher’s Stone and soon it’s up to Harry and his friends to prevent him from finding it. The plot is very novel and stands out with its fresh story line, very innovative settings and heart felt characters which made it difficult for me to believe that its J.K. Rowling’s debut novel. Though the theme of the book is magic and fantasy yet I never felt like I was reading anything far fetched. Such is the skill with which Rowling threads together the events that they feel authentic and I felt connected. Hogwarts School of Witchcraft and wizardry is a creation of genius and is depicted as a mysterious place which thrilled me with lively descriptions of ceilings that looked like stars filled sky, of ghosts floating in air, castle like settings with long passageways, direction changing stairways, moving pictures, candles floating in the air, long tables with self-appearing food, big grounds for playing quidditch etc. Rowling gives a memorable introduction to Harry with the title “The Boy Who Lived”. The setting of the scenes and the description of the characters is so lively that it created a picture in my mind and all through the book I felt like everything was happening to me firsthand. She is able to make the reader feel each and every emotion experienced by the characters in the book like surprise and happiness which Harry felt when he came to know that he was a wizard or longing, sadness and half joy when Harry could see his parents standing behind him in the Mirror of Erised. The introduction of the Durselys is also very funny. I felt I had met such people while I read the description. Rowling also sketches her characters in a comical light with introducing statements like “a big, beefy man with hardly any neck, although he did have a very large moustache”, ”thin and blonde and had nearly twice the usual amount of neck” ,”pig in a wig” for Mr Dursely, Mrs Dursely and Dudley Dursely. The same method is also adopted for the other characters which not only made them hilarious (I ended laughing like a goon) but I felt made them feel more real and effective. Harry Potter and the Philosopher's Stone is a 5 on 5 book with vivid characters that we all connect to and love like the wild looking but very caring Hagrid; gentle and a genius yet with a bit of humorous eccentricity Dumbledore; stern but kind, mother like McGonagall; bossy Hermoine; a best friend Ron; an enigma Snape; forgetful Neville; mischief makers George & Fred Weasely. The book is teeming with characters from teachers to students to house ghosts and it’s very easy to love or at least love to hate them. The book hooked me like it had done the first time I had read it years back. I have lost count of the number of times I have read this book but I still feel a thrill every time I pick it up to read such is the magic of Harry Potter. Kudos to J.K. Rowling for writing such an inventive and imaginative novel and I am just dying to review the next book in the series.